Whether install new fiber links or troubleshooting an existing network, the faster you can locate a problem, the faster you can fix it. To locate the faults in fiber optic cables in a short time, various fiber optic testers are being invited to locate the faults of the fiber optic cable, like OTDR (optical time-domain reflectometer). However, OTDR has dead zone during the testing. Another simple and useful tester which can work in an OTDR dead zone is usually being used to work as an accessory of OTDR. It is known as VFL (visual fault locator) which can also work alone to locate the faults in fiber optic cable in a time saving manner in some situations. Visual fault locator is now one of the most commonly used fiber optic testing devices to trace optical fibers, check fiber continuity and find faults such as breaks, bad splices and tight, sharp bends in fiber optic cable. 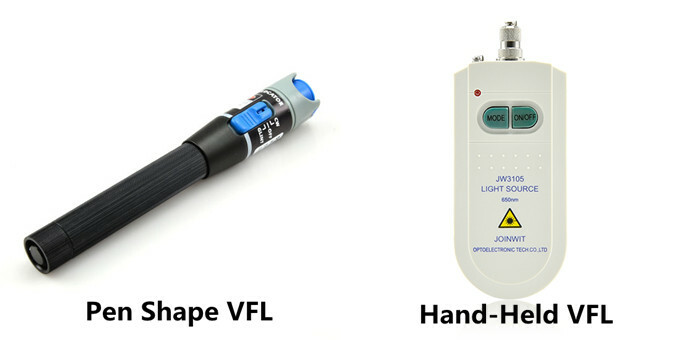 The most popular visual fault locators are pen shape VFL and hand-held VFL, which are showed in the following picture respectively. The light used for transmit signals over fiber optic is usually at 1300 to 1650nm wavelength which is invisible to naked eyes. Unlike OTDR which measures the time of the incidence and the amplitude of the reflected pulses sent to the fiber optic cable to locate the faults, VFL uses powerful visible light at the 360 to 670nm wavelength injecting to a fiber to visually and directly locate the faults in fiber optic cable. The visible light travels along the core until it reaches a fault, where it leaks out. Light leaking through the fault can be seen through plastic coating and jackets under suitable illumination. This is how VFL locates the faults in fiber optic cable. Visual fault locators radiate in continuous wave (CW) or pulse modes. The glint of the light source in VFL is usually at 1 or 2 Hz, kHz range is also being provided in today’s market. The output power is generally at 1 mW or less. The working distance of a VFL is usually in the range of 2 to 5 km. Step One: remove the plastic connector covers from both ends of the test fiber cable. Step Two: connect the fiber optic visual fault locator one end of the fiber. Press the tester button and observe that light emanates from the other end of the fiber. This gives a simple indication of the continuity of the fiber link. Step Three: repeat with several other fibers. Check for light that can be seen leaking from a faulty splice. This may illustrate an easy way of carrying out visual fault finding on bad splices or joints. Step Four: disconnect all equipment, put the plastic covers back on the connector ends and return everything to the state it was in before you started the practical so that the next group can carry out the practical in full. 1.Never look directly into the VFL’s output. 2.Cover the VFL’s output with the dust cap when the VFL is not in use. 3.Not recommended for use on dark colored or armored cables. Using simple but useful technical principle, visual fault locator individually can provide an economic and time saving solution to locator faults in fiber optic cables in some cases. While working as an accessory of OTDR, VFL, together with OTDR, can provide the fiber technician the best solution to locate fiber faults. This entry was posted in Fiber Testers & Tools, Visual Fault Locator and tagged fiber optic cable testing, how to use visual fault locator, OTDR, VFL, Visual Fault Locator on September 22, 2015 by Alice Gui. Fiberstore is specialized in supplying fiber optic components and network equipment. 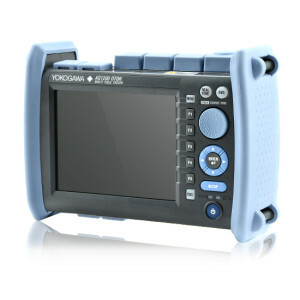 Famous YOKOGAWA AQ series ODTR is also on sale in Fiberstore. 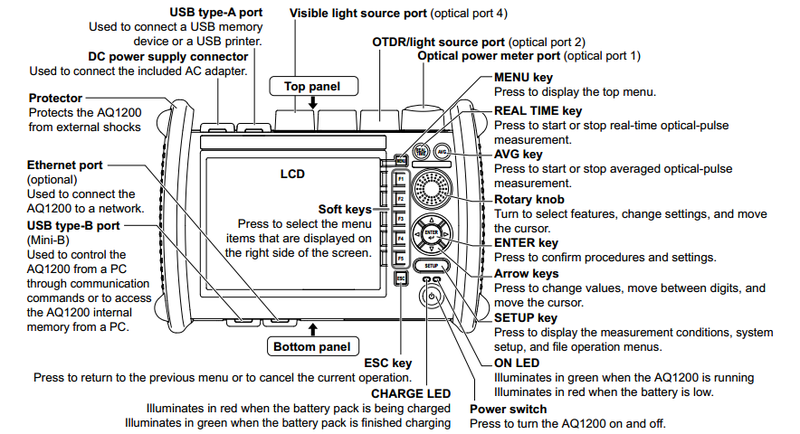 In this article we will introduce AQ1200 handheld OTDR(Figure 1.) which is the newest addition to Yokogawa’s OTDR product family offering an even smaller and lighter alternative to the AQ7275 models. The AQ1200A (1310/1550nm) is a standard model with the same wavelengths used for communication services. Some of AQ1200’s basic functions and operating notes will be decribed in this paper. After receiving your oderd AQ1200 MFT-ODTR Handheld Optical Fiber Test Tool from Fiberstore, you may check out the pacakage items as the Figure 2. . If the wrong items have been delivered, if items are missing, or if there is a problem with the appearance of the items, contact Fiberstore as soon as possible. Everyone who use AQ1200 must comply with the safety precautions. If instrument is impaired by being used in a manner not specified in the safety precautions, Fiberstore assumes no liability for the customer’s failure to comply with these requirements. AQ1200 MFT-ODTR Handheld Optical Fiber Test Toola is a compact and lightweight handheld OTDR with functionality optimized for the installation and maintenance of optical fiber cables and equipped with functions and operability that make the field testing easier. Names and Functions of parts will be clearly decribed in Figure 3. and Figure 4.. Same brand, same quality, same warrenty, why not choose the cheaper one? This is the directly answer why choose Fiberstore as your YOKOGAWA AQ1200 MFT-ODTR Handheld Optical Fiber Test Tool supplier. 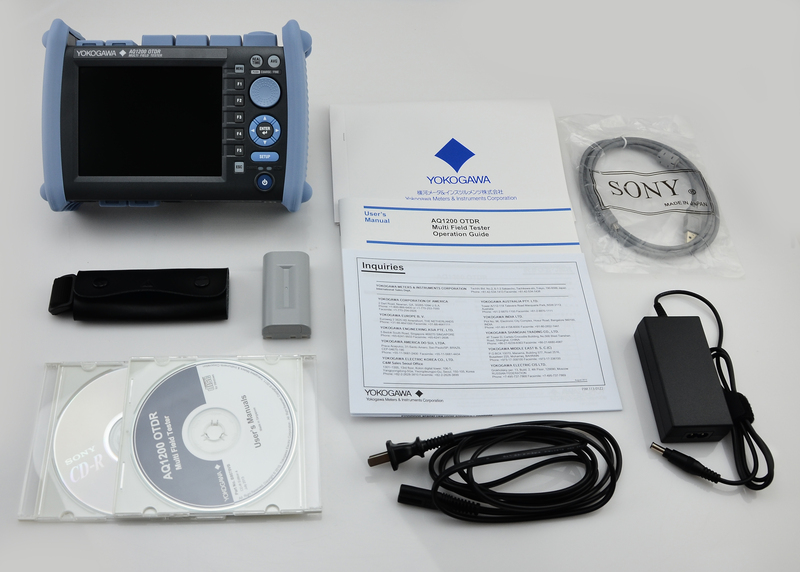 Fiberstore supplys OTDR of famous brands except YOKOGAWA AQ series, such as JDSU MTS series, EXFO FTB series and so on. 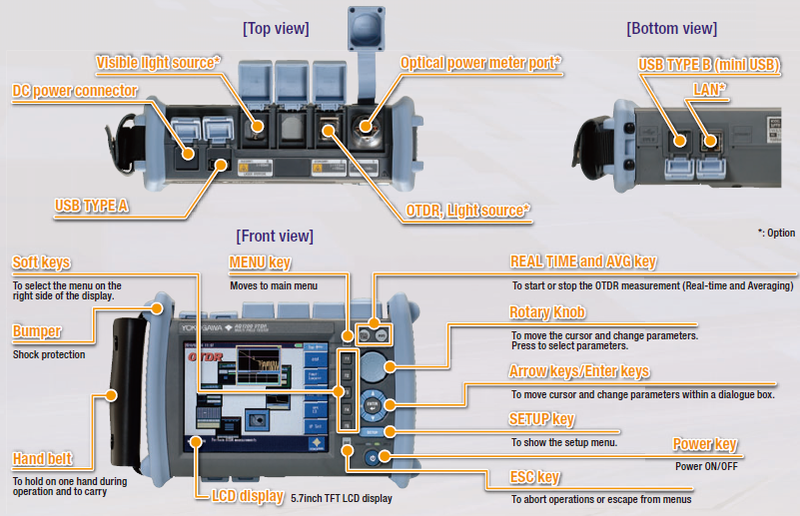 In addition, OEM portable and handheld OTDRs (manufactured by Fiberstore) are also available. All OTDRs are saled with a very reasonable price and warrenty for one year. Want to know more, welcome to our website: http://www.fs.com. This entry was posted in OTDR and tagged AQ1200 MFT-OTDR, OTDR, YOKOGAWA on September 11, 2014 by Admin. Huawei announced that they have successfully developed the industry’s largest spectral built-in optical time domain reflection tester, which maximum support is 1:64, through the network simulation, its precision is up to 5 meters. The technique breakthrough marked the eOTDR technology has reached FTTHPON network commercial networking requirements. Embedded Optical Time Domain Reflectometer, which is short for eOTDR. It’s the utilization of scattering light in optical fiber transmission and precision instrument, is mainly used for optical fiber quality detection and fault location, etc. Traditional external OTDR test system in PON FTTH network maintenance and fault detection, the need to change the ODN physical optical fiber connection, the system has high cost, difficult to implement. With the development of FTTx, optical fiber developed quickly. Operators increase investments for fiber optic network year by year. How to manage cables management quickly and efficiently, to reduce OPEX, become the urgent demand of operators FTTx network construction. Huawei eOTDR prototype through the built-in OTDR in OLTPON optical module, which can judge the fiber’s physical connection. At the same time, the built-in OTDR module and ordinary optical module size is consistent. Operators will place ordinary optical module with built-in OTDR optical module, but can not change the FTTx fiber physical network, also do not need ONT extra coordinate positioning, to avoid the external engineering of OTDR test, shorten the time needed for a fiber fault location, reduce the fiber optic fault management costs. The industry mainstream manufacturers provide 1:8 eOTDR product ratio, after many years of technical research and experimental verification, the breakthrough to develop the 1:64 eOTDR prototype, covering the mainstream of FTTH patch cables construction scene, marked the eOTDR technology realized, breakthroughs from lab scale to commercial technological. This entry was posted in OTDR and tagged eOTDR, FTTH patch cables, OTDR on April 20, 2013 by Admin.